Recent Acquisitions and Promised Gifts. Sculpture, Drawings, Prints. National Gallery of Art, Washington, 1974, no. 48 (Konrad Oberhuber). Van Dyck: The Anatomy of Portraiture, The Frick Collection, New York, 2016, no. 6, repro. Barnes, Susan. 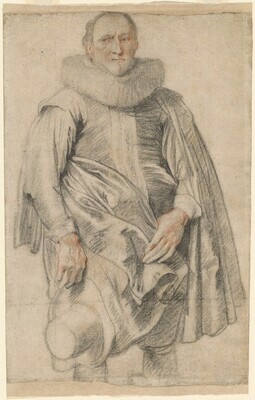 Van Dyck. A Complete Catalogue of the Paintings. New Haven and London, 2004: 112, under no. I.116 (entry by Nora De Poorter). Antoon van Dyck, Portraits. Exh. cat. Musée Jacquemart-André, Paris, 2008: 48, under no. 2, fig. 26 (entry by Nico Van Hout). Logan, Anne-Marie. "Anthony van Dyck: His Early Drawings during the First Antwerp Period," in Alejandro Vergara and Friso Lammertse, The Young Van Dyck. Exh. cat. Museo del Prado, Madrid, 2012, 83-84, fig. 29 (as attributed to Van Dyck). Alsteens, Stijn. "A Note on the Young Van Dyck." Burlington Magazine 156 (February 2014): 88-90, fig. 16 (color), note 22.